Need a price or quote? You can get an instant online price for tens of thousands of products. All of our most-popular products have live prices online, which include GST and delivery! 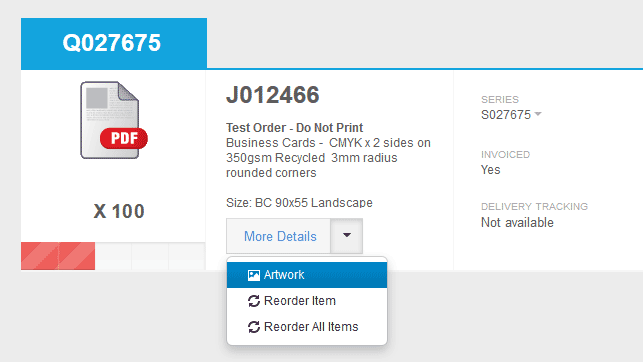 Find your printing product in the “Printing” menu above, or get an instant online quote below. Need a quote for your printing? Log in to your account to get a detailed quote for your printing. You can select from tens of thousands of options for an instant online quote. Will you match a cheaper price? Our online prices are great value for quality Australian printing, with discounts for bulk quantities and free delivery Australia wide. You may find a cheaper price for printing, but we’re confident you won’t find better value. Need help with your artwork files? Need help working your online account? It’s easy to place an order online for printing. Click the big red Start Order button. Once you have logged in to your account, click on your account icon in the TOP-RIGHT of the screen. You can view your history of orders and quotes once you login to your account. Click on View Quotes or View Orders to see a list. Login, and go to your Orders screen. 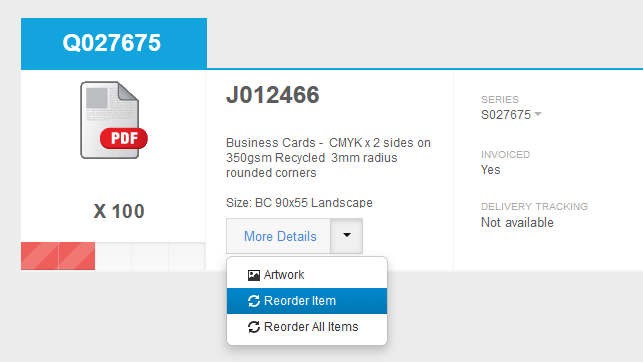 Click the arrow next to “More Details” and then “Reorder Item”. If you have found a system or website error, please let us know so we can get it resolved. What is the status of my printing? Login to your account to check the status of your printing. Find your job on the Orders screen, and place your mouse cursor over the status bar underneath. Not happy with your printing? Let’s fix it. If you have received a different product or quantity to what you ordered, we can offer a free reprint so that your order is fulfilled. Please carefully check your online order and invoice to confirm what you have actually ordered. Sometimes printing is delivered in separate parcels, at different times. Your full order may still arrive. If some of your printing is damaged, you may still have enough good prints since we usually print more than the quantity you ordered. You may need to count or calculate how many prints you have to discount any damaged prints. If your printing has spelling errors or other differences in the printing, please read further below. If your printing has spelling or other errors, it’s important to first check the proof that you approved. Re-check your email proof, or login to your account. If your proof does match your finished print, and also contains the same error, then unfortunately you have noticed the error too late and should not of approved the proof. You may need to re-order your printing after fixing the error in the artwork. Even if we edited the artwork for you, it is your responsibility to check your proof carefully before approving it for print. This is all outlined when we send you a proof, and our Printing Terms. If your proof was correct, but your printing is incorrect, then please email us ASAP with your order number so that we can reprint the correct artwork. If you believe your printing is of a poor standard, we need to inspect and investigate your print job before deciding what to do. The majority of complaints about print quality are due to the artwork provided. Even if your artwork looks fine at first glance, there are hidden specs inside the artwork file which affect the quality of the print. If you are capable, please thoroughly inspect your artwork before lodging a complaint. Printing presses print in CMYK colour, which generally appear duller than the RGB colours you view on a screen. Printing can change appearance between different printing presses, with different paper stocks, printed at different times. Even with the identical artwork submitted, your printing may still appear differently from time to time. We also allow for a certain tolerance in variation. Trimming can and will shift occasionally, which is why we require bleeds and margins in artwork. Movement under 1mm should be accounted for with your bleeds and margins. Full colour printing uses tiny dots of ink to make a range of colours. If you can see the small dots, this is normal! The appearance of dots can be minimised with an careful selection of CMYK colours in your artwork. We usually provide extra prints in your order. If some of your prints are damaged, you may need to count or calculate if you have your full ordered received. Are all or some of your prints affected? How many? Attach photos highlighting your complaint. We will then investigate your order for you, and provide you with an outcome. We have a wide range of stocks you can choose from when ordering and getting an instant online quote for your printing. Checkout our Business cards, Postcards and Presentation Folders. Checkout our Letterheads, Notepads and Compliment Slips. Checkout our flyers, brochures, booklets and magazines. Celloglaze and laminate are the same thing, a clear coating that finishes off your printing nicely. Choose from either shiny gloss, or silky matte celloglaze to laminate your Business Cards, Postcards, Presentation Folders and Booklets. Celloglaze makes card stock more sturdy and durable, and protects the ink from moisture. Stock needs to have a minimum weight of 200gsm to be laminated, although our Eco Recycled stock can not be laminated. Matte celloglaze is suitable for writing on, however the shiny gloss laminate can be difficult to write on with some pens. To use our 3D-UV Raised Spot Gloss Varnish, your printing must first have matte celloglaze on the printing, so that the 3D-UV has something to adhere to. Get an instant online quote for laminating your printing. If lamination is not a selectable option when getting your online price, it would be because celloglaze is not compatible with the particular product or combination. Need to set or update your delivery address? Missing your delivery deadline can be a pain when you don’t have printing ready for your event. The turnaround times we advertise are an average guide, and can not be used as guarantees. Customers are responsible for ordering with plenty of time for pre-production, production, dispatch and delivery. See our Printing Terms for more information. Unless your Account Manager provided you with a written, guaranteed turnaround of dispatch, then we won’t be held responsible for delivery of printing beyond your deadline. Even if we noted that your printing should arrive on time, you are responsible for ordering with plenty of time for pre-production, production, dispatch and delivery. Please be aware that once printing has been dispatched, we can not control the speed or performance of courier delivery. If we can provide you with a consignment number for your parcel, then it is your responsibility to liaise with the courier regarding your delivery. Our average turnaround time for printing is approximately one week on average. We can print faster on request, but will rarely provide a guaranteed turnaround. You can set any delivery address for your printing. 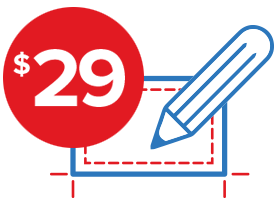 When ordering online in the Freight section, you can ADD or EDIT an address. You can change your delivery address yourself, up until you have paid for your order online. After then, we will need to change it for you. If your printing has already been dispatched, it may be too late to change the address. That’s right, all of our printing prices include GST and delivery to street addresses in Australia. We can’t deliver to PO boxes unfortunately. We provide 1 free delivery to your street address. If your address you provide is incorrect and the parcel is returned to us, then you will be charged a re-delivery fee. For the fastest service and response, please use our informative website and the links provided. If you can’t find what you need, please send us a message. You can email us at admin(at)wherethetradebuys.com.au. Please include a reference to your account or order number. Please be specific with the error you have found, including a link to the web page with the error.